You’d be hard pressed to find another piece of furniture that is more functional than our Oxford sleeper sectional. It’s four helpful things in one. Oxford sleeper sectional in Dawson Cement with Quinn chair. A streamlined frame and armless chaise help you pack ample seating into a compact design. 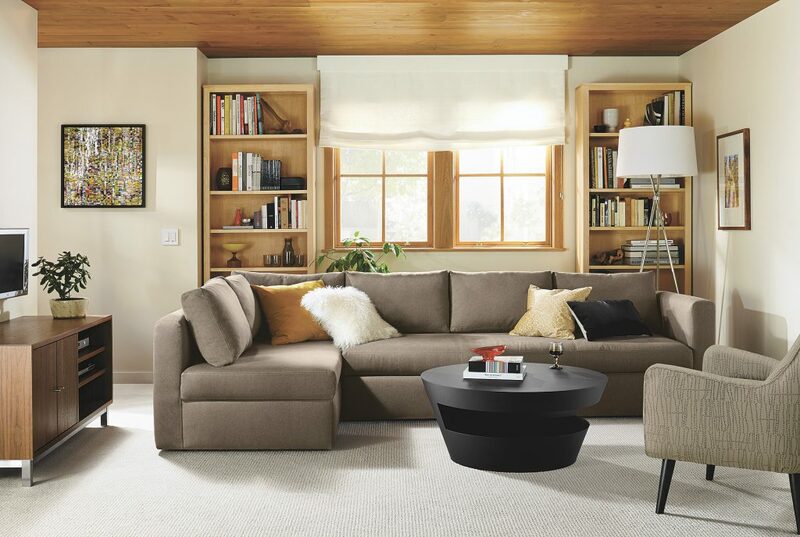 There are two different sectional sizes available, plus two sofa sizes and a chair. A hidden “trundle” glides out of the base and pops up to be even with the seat. This is the easiest set up of any sleeper in our assortment. Plus the seat cushions double as the sleep surface and are made from individually encased coils that isolate movement for less partner disturbance and sounder sleep. As if the sleeper wasn’t enough, the chaise opens up to store all your living room and guest room essentials, like bedding, pillows, books and games. A heavy-duty, soft-close hinge means you can’t slam your fingers. The pop-up platform isn’t just for guests. Set it up for movie night and everyone can put up their feet. Check out this video to see how easy it is to use.